Band Of Frequencies release the first single 'FREE AGAIN' from their forthcoming second album 'Rise Like The Sun'. 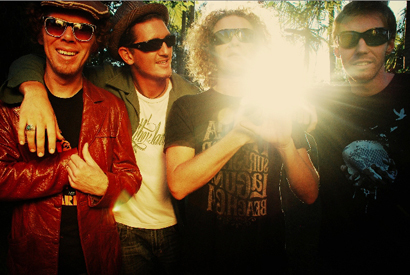 A headline act at the Noosa Festival of Surfing in March 2011, Band of Frequencies have become festival favourites having played at all major surf events on the East Coast as well as Spleandour In The grass and Woodford Folk Festival. They are highly regarded in international surfing circles through their contributions to surf films such as Dave Rastovich's 'Life Like Liquid' (2006), and Cyrus Sutton's/Ubiquity records 'Under The Sun' (2008). Most recently, lead singer/guitarist Shannon Sol Carroll featured in 'The Present' by Thomas Campbell (The Seedling, Sprout) surfing and recording part of the Soundtrack in West Africa. Band Of Frequencies celebrate the release of ‘Free Again’ with four very special shows with special guests THE DEADBEAT BAND & BOBBY ALU in May & June 2011. "This song reflects on walking the well trodden path when all you really want to do was trust in your own sense of direction, break away from the illusions of securityand follow your passion. It's all about believing in what you love and loving what you belive in."